When it’s time to elevate the look, feel, and value of your home, count on waterproof flooring to provide everyday beauty for your interior. Our flooring center is your source for fashionable and durable flooring materials. With our wide selection of tile, carpet, and vinyl flooring, you have the variety you want while keeping your interior neat and clean. Waterproof flooring from our collections offers a number of benefits. Moisture and spills are two of the leading causes of premature wear and tear in flooring. Moisture attracts stains, and in extreme cases can cultivate the growth of mold and mildew. Uphold the beauty and health of your interior with waterproofing. With waterproof vinyl flooring and waterproof carpet from our store, you have the right materials to begin your next interior remodeling project. Water and moisture never have to damage your home. Floor coverings that are designed to “wick” them away or resist them make it easier to clean up messes. Water-resistant surfaces prevent water from seeping into the subfloor, which can damage your foundation. With the right flooring materials, you can focus on having a dazzling interior. It’s an investment that ensures the strength, longevity, and re-sale value of your property. Our store proudly carries products from well-known brands, including Tigressa and Downs. 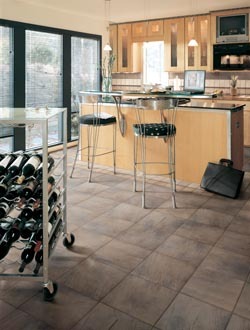 Improve the durability and visual appeal of your home with waterproof luxury vinyl flooring. Vinyl has long been a trusted material for its resilience. Indeed, its composition makes it a perfect candidate for virtually any room. Crafted from several layers of composite materials, waterproof vinyl flooring is well-known for its pleasant feeling underfoot, non-porous surface, and diverse applications. The surface of vinyl will makes it resistant against scuffs, bumps, and scrapes. As such, it’s a good material to place in high-traffic areas, like the kitchen or bathroom. On top of that, the surface of vinyl resists water and staining with ease. Simply use a detergent and either a mop or cloth to keep your investment looking new. Vinyl is available in tiles or planks. As such, you have access to a wealth of design options when choosing this material. Tiles are available in many different colors, styles, and designs. In fact, contemporary manufacturing methods also allow vinyl to be available in the appearance of other materials, like stone and hardwood. Our store has many different brands and styles on display so you can begin planning with ease. It’s easy to see why carpeting has held firm as a popular flooring option. The distinct textures, vibrant colors, and wealth of weave patterns make carpet a fine choice for bedrooms and common areas. With waterproof carpet, you are able to add luxury to your home without adding to your maintenance worries. Advanced manufacturing techniques have made carpeting more resilient against water, spills, and staining. Our selection of waterproof carpeting includes products with special dyes or distinct weave patterns which are designed to resist spills and moisture. This makes cleaning up messes easier, while also protecting your investment from fading or premature wear. Simply speak with our flooring associates to view samples of carpeting that takes advantage of these new technologies. We provide the resources you need to steer your remodeling project in a bold direction. Contact us to request a consultation for new, waterproof flooring. Ask about our 12-18 month financing options. We proudly serve property owners throughout Santa Barbara, as well as Isla Vista, Mission Canyon, Montecito, and Summerland, California, as well as the surrounding area.